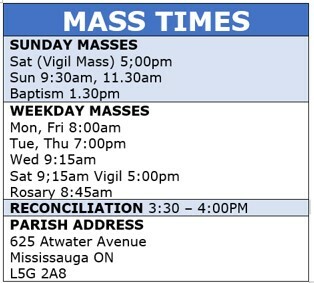 We welcome all parishioners to our parish and welcome back those who have been traveling during the summer months. A special welcome to those parishioners who are new and have joined the parish over the summer months. Please register with the parish, if you are new, by filling out a blue card obtainable from the office. Please place it in the collection basket next Sunday and you will be included in the roster of parishioners. We also welcome back our Principals, Julie Tollis at St. Dominic Catholic School, Michelle McCann at Queen of Heaven Catholic School and Jim Horvath at St. Paul Catholic Secondary School. We wish our teachers and students great success during this school year. Our schools are an integral part of our parish and we look forward to a great relationship with them. The Harvest Bazaar is on September 29. The Pasta dinner is on November 24. These events are a chance for you to come out and get to know your fellow parishioners. When Jesus approaches a man who is both deaf and a stutterer, Jesus shows his considerateness for this man's predicament. Jesus takes him aside privately, no doubt to remove him from embarrassment with a noisy crowd of gawkers (onlookers). Jesus then puts his fingers into the deaf man's ears and he touches the man's tongue with his own spittle to physically identify with this man's infirmity and to awaken faith in him. With a word of command the poor man's ears were opened, his tongue was released, and he spoke plainly. What is the significance of Jesus putting his fingers into the man's ears? Gregory the Great, a church father from the 6th century, comments on this miracle: "The Spirit is called the finger of God. When the Lord puts his fingers into the ears of the deaf mute, he was opening the soul of man to faith through the gifts of the Holy Spirit."